A clean record of financial transactions is essential to a business running smoothly and growing into the future. Unfortunately, most business owners struggle to keep up with their books, either because they’re not formally trained in the skill or they simply do not have time to do so. All businesses, no matter their size, can benefit from working with a bookkeeper to keep their books clean and in order. Organized and orderly books help owners make more informed financial decisions as their business grows. 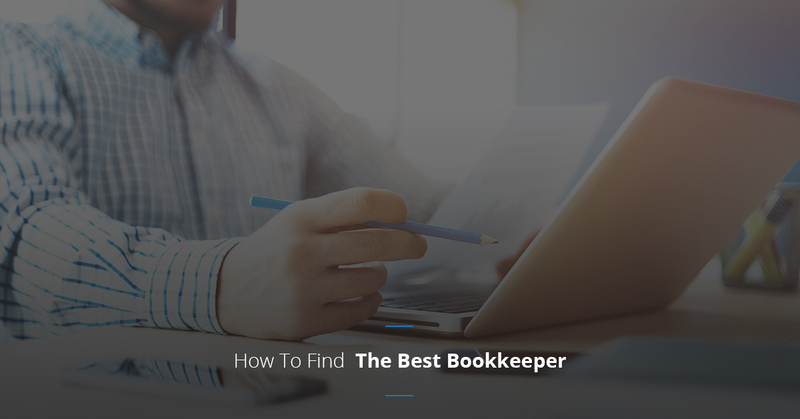 As a business owner, there’s no reason to struggle with your books when you follow these simple steps to find the best bookkeeper for your business. You’re in search of a bookkeeping professional, either because you do not have time to take care of the books anymore, or you simply want to delegate the responsibility so you can focus on growing your business. It’s important to understand what you actually need from your bookkeeper before you go and hire one. Consider your business type, the accounting software you’re utilizing, the number of transactions you handle, and the general bookkeeping services you need. Doing this work up front will greatly decrease the time it takes to find the right professional to record your business financials. It can be tempting to go out and find the most cost-effective bookkeeper to take care of your financials, but it’s more advantageous to find a bookkeeping professional who understands your industry and your business. Your bookkeeper should intimately know how you operate, what your expenses are, and who you bill. Costly errors can occur when your bookkeeper does not fully understand your business. You’re looking for knowledge and experience in your given industry, as well as a comprehensive understanding of your business. An organized financial book is a profitable financial book. You want a bookkeeping professional who is a line-item hawk. They see everything, and they make sure your financials are in order. When your books are in order, you can make informed financial decisions that have the potential to make you more than if your books were a mess. One of the fastest ways to find a bookkeeper for your business is to ask someone in your industry you trust. Do you already work with an accounting firm? Ask if they offer bookkeeping services that you can add to your service package. You can also search for qualified bookkeepers through the Small Business Development Centers (SBDCs) in your area. There are dozens of accounting softwares available to bookkeepers in the industry. You want to discover which one your potential bookkeeper uses and if you have administrative rights over the information in the software. One of the biggest headaches for small business owners is to not have access to their own financial information due to the software used and the bookkeeping professional’s policies. Confirm the software being used and your access to that software before hiring a bookkeeper as a partner for your business. Led by principal bookkeeper Kendra Moore, Furever Bookkeeping provides comprehensive bookkeeping services to businesses in Maryland. With more than 15 years of experience, Furever Bookkeeping wields experience with businesses in a wide range of industries, as well as books ranging from $200K up to and in excess of $32M. A portion of Furever Bookkeeping’s revenue goes toward animal-abuse awareness efforts to help forgotten dogs find “furever” homes.